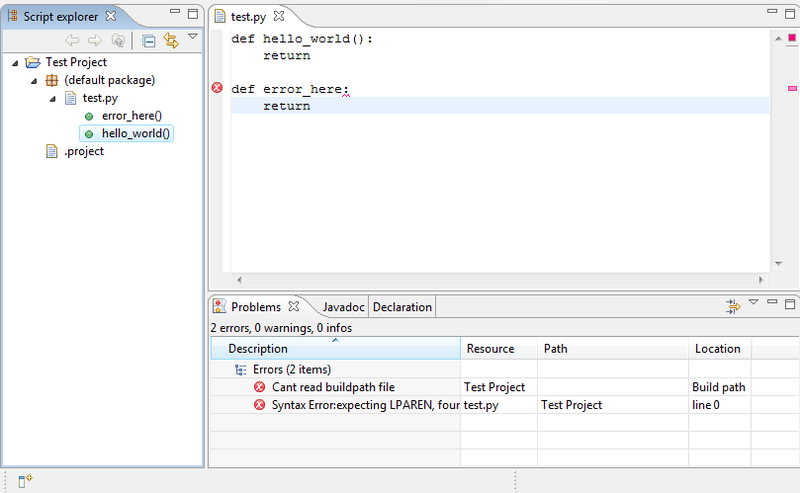 This article describes the steps one is to take when building an integrated development environment (IDE) for a dynamically-typed language using the Eclipse Dynamic Languages Toolkit (DLTK). language toolkit – parsers, checkers, selection, completion engines, etc. UI language toolkit – label providers, and so on. other extension points, like documentation providers, view filters, etc. Lets make simple example IDE and see how these mechanisms could be used. For language lets select Python. You'll need DLTK Core SDK available in your workspace. Most non-UI language-specific things are provided to DLTK by a language toolkit. It's most important thing in DLTK and language specific code interaction. Language toolkit could be added to project by using org.eclipse.dltk.language extension point, and requires definition of Eclipse project nature. Primary thing that language toolkit should provide is a source element parser. This parser builds a source module content, so it could be accessible from DLTK (from script explorer for example). Other required thing is a source module validation. Basically it could be just checking for a file name extension, in more complex cases it could be checks for file headers and more. UI stuff could be extended gradually as required. Now for a start we will make example plug-in project, define language toolkit, nature and implement source element parser for a Python language. org.eclipse.dltk.core – core of DLTK. org.eclipse.core.filesystem – Eclipse file system. org.eclipse.core.resources – Eclipse Resources, Workspace. After that we could start adding nature, toolkit and source element parser. 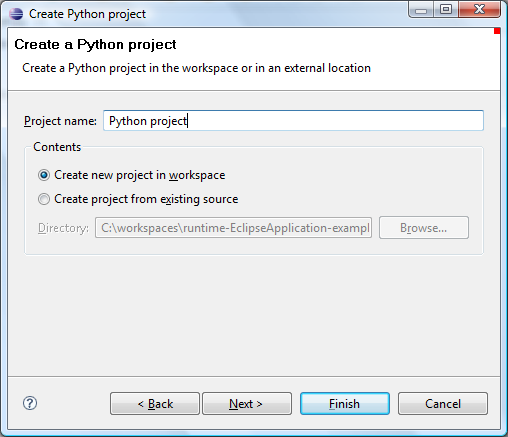 In extensions tab we need to create an extension to the org.eclipse.core.resource.natures extension point and define it ID: org.eclipse.dltk.examples.python.core.nature, and create nature class PythonNature which extends ScriptNature class. ScriptNature class has all required stuff for nature management. It also sets up incremental builder for project. 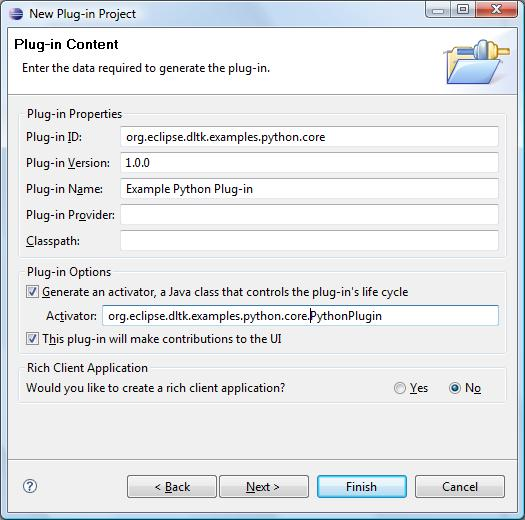 In extensions tab we need to create org.eclipse.dltk.core.language extension point and define nature id( we just created it): org.eclipse.dltk.examples.python.nature and language toolkit class, which implements IDLTKLanguageToolkit, lets name it PythonLanguageToolkit. Language toolkit could extend AbstractLanguageToolkit class for some basic implementation. Most methods could be left stubs. 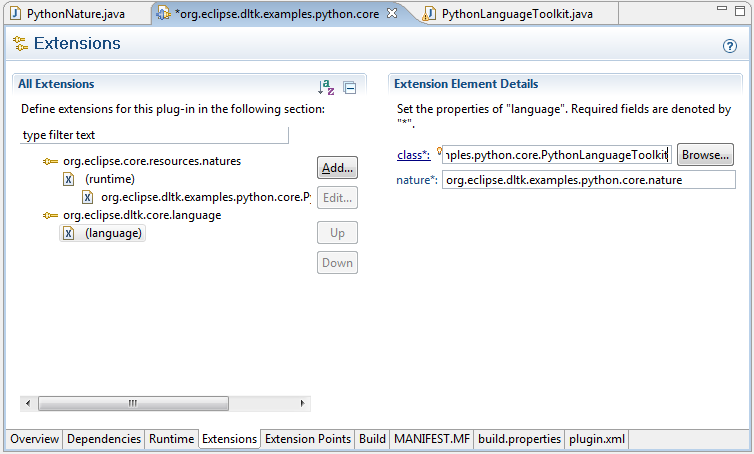 Also you should specify org.eclipse.dltk.ui.language extension with UI stuff. Lets create class PythonSourceElementParser which implements ISourceElementParser interface. This class used to build model for source modules (The required IProblemReporter can be imported from org.eclipse.dltk.compiler.problem.IProblemReporter). We need to specify org.eclipse.dltk.core.sourceElementParsers extension point. Extension point schema almost same to language toolkit schema. For now we have almost all required for start working. We could Run Eclipse with our code, create project, setup nature, and Script Explorer will show source folders, and so on. Index will look for sources and index all content returned from source element parser( it returns empty for this time ). We need to add project nature: org.eclipse.dltk.examples.python.core.nature. 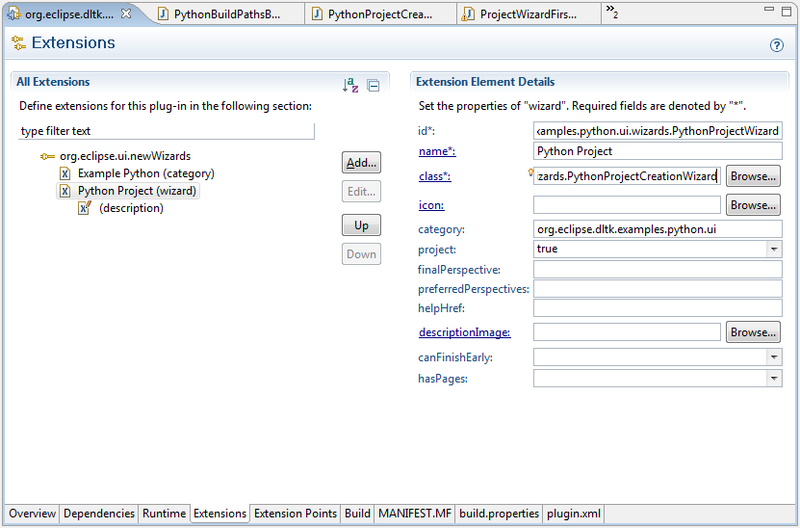 To start working with language we need project creation wizard and editor. Outline view also could be useful. 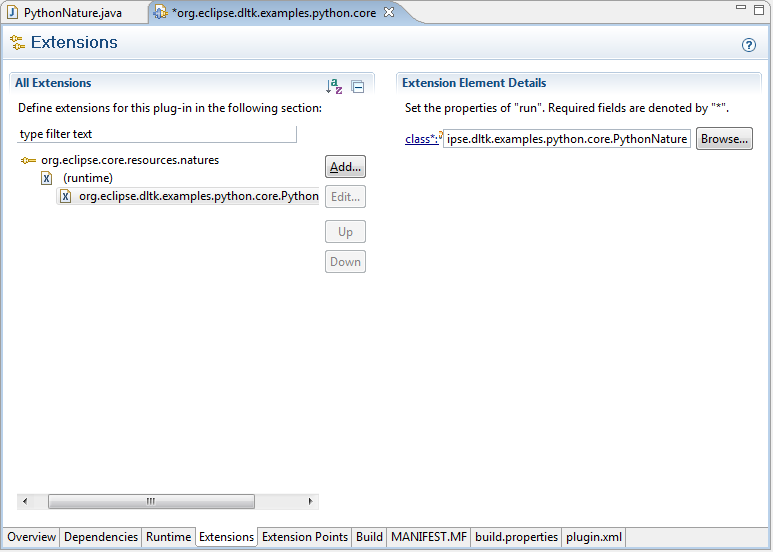 First, let’s create a separate UI plugin, for example org.eclipse.dltk.examples.python.ui. 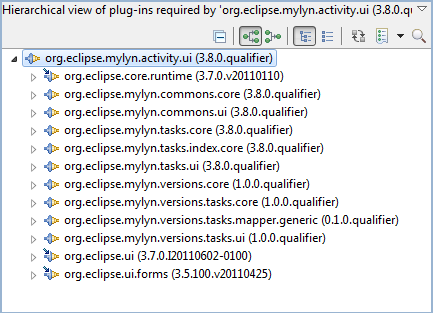 Immediately after that, we add following dependencies (they will be used in future): org.eclipse.dltk.ui, org.eclipse.dltk.core, org.eclipse.dltk.launching, org.eclipse.ui.ide, org.eclipse.core.resources, and plugin that we created above: org.eclipse.dltk.examples.python. 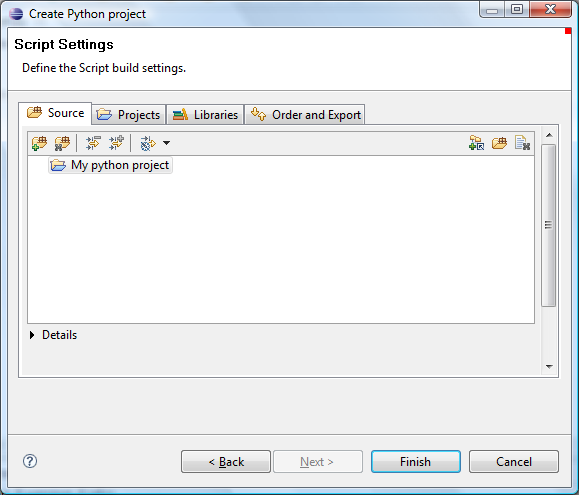 Let’s create class PythonEditor, using ScriptEditor as base. It has abstract methods for creating folding structure provider, outline page, etc. In most cases it’s enough to leave them returning null. 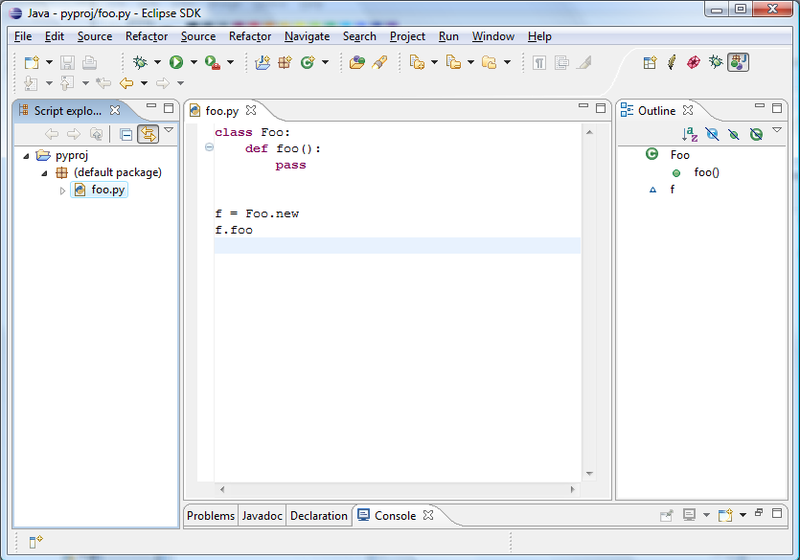 After that we just register editor through org.eclipse.editors extension point. Of course, you can use your own editor, but ScriptEditor base has lot’s of things, that are already implemented. Also revealing model elements in editor and other stuff would work only with a ScriptEditor. Editor class has methods doCreateOutlinePage() and getFoldingStructureProvider(). Using base classes ScriptOutlinePage and AbstractASTFoldingStructureProvider we can very easily fetch outline view and folding, based on AST. Their implementations would be about half-screen of code. You also could add other UI like preferences, dialog pages(search, for ex.) and other. Structured source model, with delta management. Indexed source code. (By default all declarations are indexed). Fast search engine. Many free UI, like ScriptExplorer, Outline, Search and so on. 1. Latest DLTK 1.0 integration build required. 2. Eclipse 3.3M6 or later required.